Looking at this bad wipeout it's hard not to be surprised that the driver survived. Apparently, the 52-year-old driver was not wearing a seatbelt and was thrown from his car before it landed wheels-up in the ditch. Though lucky to survive, the man is in stable but serious condition in a hospital with significant chest injuries. 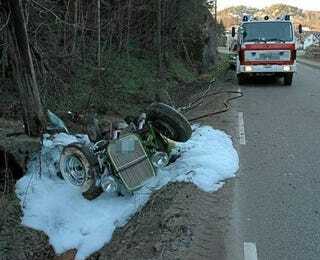 Because of the foam it is sort of hard to get a read on what happened but there don't appear to be any visible skid marks, which makes us wonder how far it flipped before arriving in the ditch or if it came from the other side of the road. A picture of the hot rod pre-destruction below the jump.